Cool and refreshing... best describes this sherbet inspired pistachio green and orange bag. Orange patent leather handles and eyelash trim highlight this happy bag. Green and gold sequins are sprinkled throughout for just the right amount of bling. 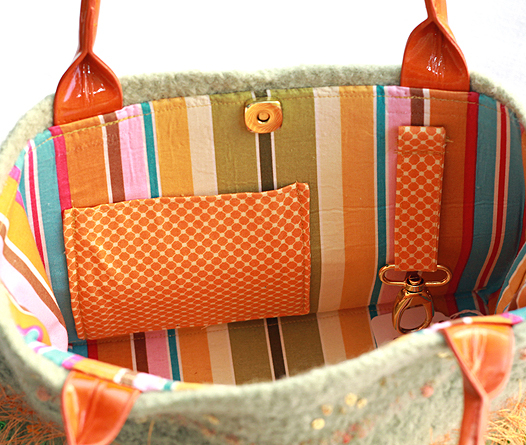 Sneak a peak inside... a big and bold multi colored stripe lining and pockets made from a complimentary orange and white geometric print keep everything neat and organized in this medium sized bag. Also features key fob and magnetic snap.